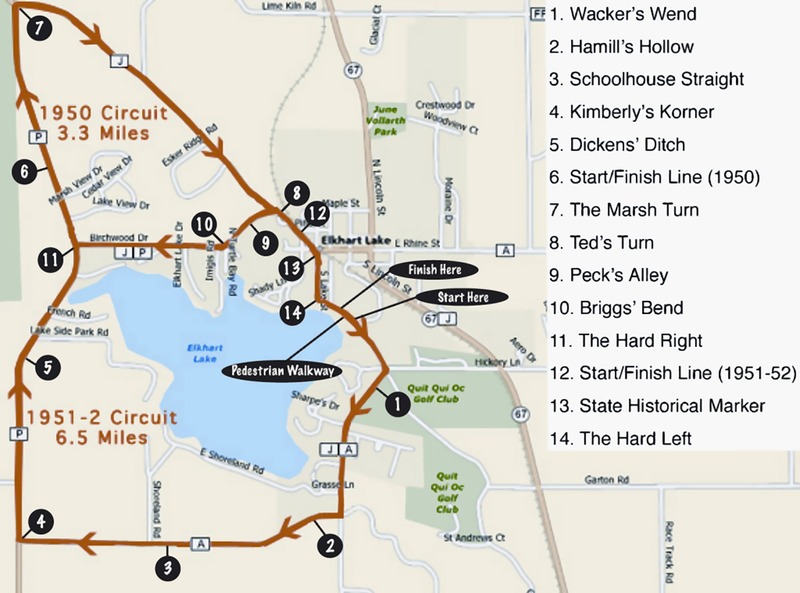 Two historic race circuits around Elkhart Lake will take you around the corners and over the hills once traveled at high speed by the world’s top sports car drivers. Fourteen historical markers are placed around Elkhart Lake’s historic open-road sports car racing circuits to commemorate the big names and the big events that occurred here between 1950 and 1952. The 1950 races, held on the 3.35-mile circuit north of the lake, had the flavor of a typical club event. All the drivers and cars came out of the Chicago Region and most cars were driven to the event, raced and then driven home. The event took place on Sunday, July 23rd and five races were held with cars divided into two classes: under 1500cc and over 1500cc. Two 30-mile races for novice drivers were held, one in each class. A novice driver was defined as one who had never finished higher than fifth in any open road race. The novice races were followed by a 15-mile ladies race that combined both classes. The day was concluded with two 60-mile races for experienced drivers, one in each class. The event was very successful with an estimated 5,000 spectators in attendance. The 1951 and 1952 races were held on a new 6.5-mile circuit that circumvented the lake and had a much different flavor. The Chicago Region of the SCCA planned, promoted and orchestrated the races and nationwide promotion attracted celebrities and professional race teams from across the country.